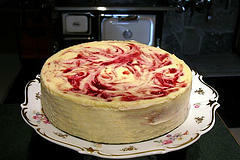 A variety of rhubarb-cake favorites includes using cherries, jello, peaches and creating a delicious one with cheese. If you like Amish baking, there's a great one here as well. Is an old-fashioned mixture your favorite? Or, do you prefer the texture of creamed cheese? Rhubarb can work with all of these tastes together and please everyone at once. Try one....you may find a new special dessert to serve. Sprinkle a small package of dry strawberry jello over top of the sugar. Serve with vanilla ice-cream for an extra rich dessert. Mix all ingredients and pour into a greased 9 x 13 inch pan. Add the nuts and topping mix below over the batter. Add a handful of chopped nuts to this dessert if you like. Sprinkle the top with 1/2 cup brown sugar and 1 tsp. cinnamon. Bake at 350 F for 45 minutes. Mix ingredients and press into a 9" pan. Line with parchment paper or foil. Mix this filling until smooth and pour into your pan. Bake at 350F for 30 - 40 minutes. Combine these ingredients and cook over medium heat for 20 minutes until rhubarb has thickened. Cook for approximately 15 minutes until well thickened. 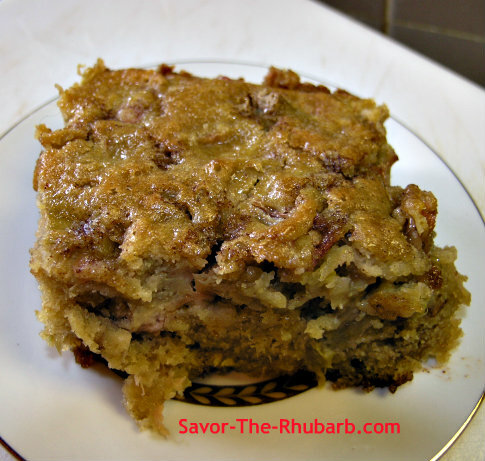 For this rhubarb-cake, you can substitute cookie crumbs. Mix the crust ingredients well. Press into a lightly greased 9 1/2 inch springform pan. Bake at 350F for 10 minutes to set the crust. Cool completely. Using a mixer, beat the cheese until smooth. Gradually add the rest of the ingredients. Stir in the sour cream and white chocolate at the end. Cover the bottom and up the sides (halfway) of the springform pan in thick foil. Pour half of the cream cheese mixture into the pan. Add spoonfuls of rhubarb puree over the top and swirl the point of a knife through the cheese. Repeat the process with the rest of the cream cheese mixture and rhubarb puree. Set the pan into a larger baking dish. Fill the baking dish with hot water and it should only be to within 1" of the top of the springform pan. Don't let the water go over!! Bake at 350 for approximately 45 minutes. Turn off the oven. Leave the cheesecakein the oven with the door shut for another hour, and then remove from the larger dish. Take the foil off from the bottom of the springform pan. Loosen the edges gently with a knife. Refrigerate overnight, and serve the next day. This cake will keep very well for a period of time refrigerated. Combine all ingredients mixing well. Pour into a 9 inch pan. 1/3 cup brown sugar 1 tblsp. melted butter 2 tsp. cinnamon. Mix and sprinkle on batter. Bake at 375F for 40 minutes. A great dessert treat served warm or cold. As per the directions, mix the lemon cake with required ingredients, but do not add the oil. 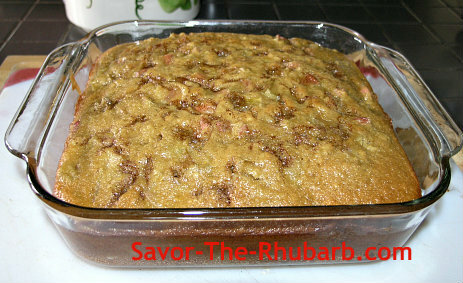 Put the cake mix in a 13 x 9 pan, and cover with the rhubarb. Pour the sugar next, and then the cream. Wonderful served with a scoop of vanilla ice-cream! In a greased 9" square pan, arrange 2 cups of diced rhubarb. Stir to make a dough. 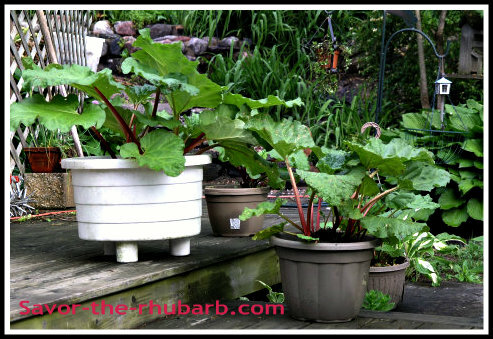 Drop by spoonfuls over the rhubarb and spread to cover as much as you can. 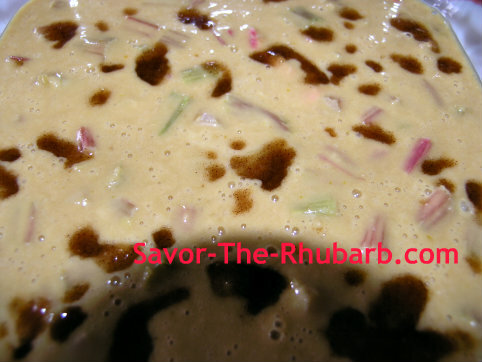 Drizzle the rhubarb royal cake. Add a scoop of vanilla ice cream if you like. Thaw the tube of crescent or biscuit dough. Set aside. Drain the peaches and save 1/2 cup of the liquid. Combine the brown sugar and cornstarch. Add the 1/2 cup of peach juice. Bring to a low boil on low heat. Let simmer and stir for 3 minutes. Add the rhubarb and simmer until rhubarb is tender. Add the vanilla and peaches. Pour into an ungreased 8 inch baking dish. Spread the biscuit dough over the top stretching as much as possible to cover. Sprinkle lightly with cinnamon. Bake at 350 F for 25 minutes. Blend the dry ingredients. Add egg, milk and butter.Place into a glass baking dish and pat down so that it fills half of the dish and is evenly distributed. Sprinkle the top with the rhubarb, and sprinkle the jello evenly over the rhubarb. Combine 1/4 cup of butter, 3/4 cup of white sugar and 1/2 cup of flour to make a streusel topping. Sprinkle over the entire mixture and bake at 350F for 45 minutes. Cream butter and sugar. Add the eggs and milk. Sift dry ingredients and add in. Toss the rhubarb lightly with a bit of flour and gently fold in. Place batter by spoonfuls into cupcake cups approximately halfway. Bake at 350F for 15 or 20 minutes. Let cool before icing. Combine all ingredients mixing well. Pour into a 13 x 9 greased baking dish. Top with 1 cup of semi-sweet chocolate chips. Or, stir the chips into the batter and later ice with your favorite chocolate icing if you prefer. Bake at 350F for 35 minutes.